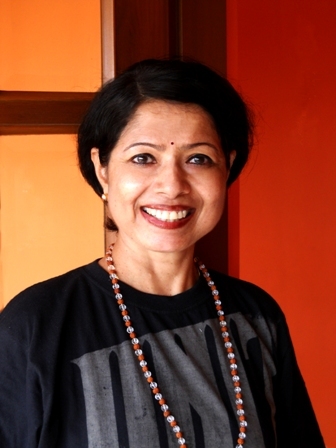 Geeta Iyer is one of the most widely known and respected Yoga teachers in Chennai, India. She is a qualified teacher and has had training in Iyengar, Integral and Sivananda styles. She has been practicing and teaching Yoga for over 25 years. Yoga has had a profound effect on Geeta’s health and life; it has motivated her to become a yoga teacher and spread the light of yoga to the larger world. Geeta practices pranayama and asanas every early morning and believes that early morning practice has a deeper and lasting effect on the body and mind. Early morning practice removes rigidity, dissolves conflicts and pain, builds strengths to face challenges with the right attitude. The positive energies developed early morning is pure and will be well preserved. Inverted asanas have profound effect on the functioning of organs, glands and systems. They prevent many health issues and provide an exhilarating effect, which everyone would love to experience in their lives. Yoga is “Svadhyaya” a self-study that develops deep self-awareness and self-understanding. Yoga, is a long pleasant journey that builds physiological and psychological balance. It brings dynamic changes within and changes the perspective towards people and life. The deep awareness helps to overcome old unhealthy habits that destroy your health. Geeta is friendly, understanding, compassionate and is dedicated to the well being of her students. She inspires her students to incorporate the principles of Yoga in their everyday lives. She teaches not just asanas and pranayama, but a way of life, giving importance to eating healthy food, proper breathing and sound sleep for 7 to 8 hours in the night. Her teaching style reflects her deep understanding of human anatomy and her ability to tailor the practice to meet each student’s needs. Geeta has had the opportunity to attend many sessions in Yoga ashrams in India and in USA. She has extensive experience teaching both individual and group classes for private and corporate clients in both countries. Her dedication to the well being of her students, her expertise, professionalism and her continued interest in psychology and physiology has made her a popular and distinguishes her from most Yoga teachers. She shares her Yoga knowledge with the broader community through her regular contributions to the ‘Wellness’ columns in the national newspapers and health magazines. 9 Comments on "About Geeta"
Hello Maam. I would like to enquire if you practice Post Natal Yoga sessions. I will be interested. Please let me know. My email is given below. I was unable to find your contact details. I do yoga practice with Geeta when I visit Chennai. She is an excellent teacher focused on the individual students’ needs. I strongly recommend her as a great yoga teacher! Is Yoga E book 2016 available in Hindi ? Do you have the print version of your book Illuminating LIves with Yoga ?